Features: 1. High-quality products 2. Interface: USB3.0 (2.0 Compatible) 3. Black external slim drive 4. Emergency eject hole 5. Fully Plug & Play, easy to install and use 6. USB Optical Drive with the durable plastic casing 7. Supports GHOST.XP. Windows SE, ME, VISTA. WIN7, Windows 8, Windows 10, Linux, MAC OS X 8. In the office or on the road, this highly portable, plug-and-play drive requires no software and is conveniently powered through your notebook's USB port 9. This Drive fits for PC Laptops Notebooks Desktop 10. 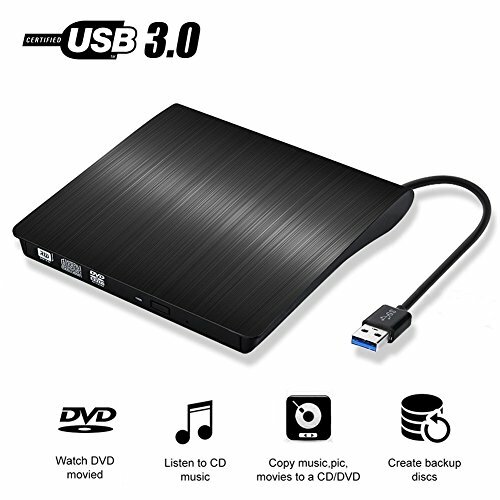 This drive can Read and Write both DVD and CD (DVD RW Drive) Instructions for use: 1.This product is a data line interface properly to USB port of the computer, the computer display lower corner should opera device icon. 2.Click on the desktop, open the "my computer", in "the mobile storage device should display the drive icon". 3.Click on this icon button, select the "pop" in the tray into the appropriate disk read. 4.Do not place the drive close to any magnetic object. 5.To ensure normal running,please place the drive on flat desktop, do not place the drive under any pressure. COMPACT DESIGN: The CD drive and the USB cable are combined in one. Embedded USB cable design, easy for storage. Ultrl Slim portable size is equipped with USB 3.0 high speed interface, bringing you faster data transfer speed and stable performance. MULTI SUPPORT : Support CD-R, CD-ROM, CD+/-RW, DVD-ROM, DVD-R, DVD+/-RW, DVD-R DL, VCD. strong error correcting ability, anti-shock and noise reduction technology, low power consumption. COMPATIBLE SYSTEMS: It support Windows XP/2003/Vista/7/8.1/10, Linux and Mac OS system. * Do not recommand Surface pro laptops because of its low power of USB interface. * Not compatible with higher version than Mac OS X Yosemite 10.10.4. HIGH QUALITY - 100% durable brand new DVD loader,Also 90 days product replacement or refund if you are not satisfied ,Any questions, just contact us freely. If you have any questions about this product by Vebox, contact us by completing and submitting the form below. If you are looking for a specif part number, please include it with your message. Dell DVD-ROM / CDR/RW COMBO DRIVE.